The Dusi canoe marathon is a 3-day race down the uMsundusi River from Pietermaritzburg to Durban which awards gold medals to the first ten finishers and a lasting sense of achievement to every other participant. Like the Comrades Marathon, it is a big event in South African sport and is known to many outside the sport. A movie about two guys on a quest for Dusi canoe marathon gold medals, however, would be expected to appeal only to canoeists and people, like myself, who are interested in all and any endurance sports. I was a bit surprised when Beyond the River was recommended by someone who, I thought, is not interested in canoeing. Now it doesn’t take much persuading to get me to go to a movie about any grueling event which is on my bucket list, so my long-suffering wife and I were among the first to book tickets and head off to the movies to see Beyond the River. This is a 100% South African film. It has an all-South African cast and was written, directed and produced by South Africans in South Africa. I have to admit though, that despite recent advances in the local industry, I went to the movie with high hopes rather than great expectations. While waiting to go into the theatre there were deafening sounds of car chases, screaming, explosions and general mayhem emanating from one of the other theatres in the complex. At its conclusion, that theatre disgorged scores of happy looking, but slightly dazed patrons. A whole five people went in to watch Beyond the River. Clearly not a movie with mass appeal, which is unfortunate as I hope that it subsequently played to bigger audiences as it is a truly excellent movie that way surpassed my high hopes and modest expectations. An important thing to note is that Beyond the River is a feature film about a human drama and not a documentary about canoeing. As such it really should appeal to an audience much wider than only those who are into canoeing or endurance sports. The movie was inspired by the exploits of Siseko Ntondini and Piers Cruickshanks who did, in real life, come from very different backgrounds and who did team up to win a gold medal in the 2014 Dusi Canoe Marathon. The movie tells the story of an elite racer (Steve played by Grant Swanby) who has won 9 Dusi gold medals and whose quest for his 10th gold ended in disaster in 2013 and who then teams up, albeit somewhat reluctantly, with a talented young paddler (Duma played by Lemogang Tsipa) who is living in poverty and headed for trouble. The makers state clearly that the movie was inspired by true events and is not a dramatized version of a true story. Piers wryly recounts in his book, Confluence, which is a true account of the actual events, that the film maker told him that his real life was just too boring to make a movie out of! Siseko and Steve did win gold in the 2014 Dusi, they do come from very different backgrounds and a number of scenes in the movie are based on true life happenings along their journey to gold. Both Steve and Piers needed a lot of persuading to let Duma and Siseko respectively take the front seat of the boat despite their inexperience. The life stories of Steve and Duma who are the characters in the movie, however, are very different from those of Piers and Siseko. Siseko and Piers are two fairly ordinary guys who worked hard, overcame disappointments and setbacks to achieve something quite extraordinary. It is ultimately a feel good movie but one which does shy away from reality and which doesn’t avoid uncomfortable truths. This is an extremely well-made movie. The story line is tight and honest and doesn’t shy away from the realities of life in a country as divided and unequal as South Africa is. The characters are complex, believable and very human. Messages abound in this movie but these are subtle and there is no overbearing preaching or moralizing. To use a cliché, the writer tells it like it is, warts and all. (Sorry that was more than one cliché…)The script introduces drama and emotion without ever becoming maudlin. The direction is as sharp as a razor and the scenes never drag or become overdone. There is not a single piece of over-acting or wooden performance from the cast who deliver gold medal performances. The cinematography is nothing short of breath-taking and takes full advantage of the natural beauty of the Dusi route. Again the honesty of the film shines through in the depiction of the worst of the urban wastelands where Duma lives in a shack. Excellent use is made of “props” – the ugliness of the huge electrical pylons crisscrossing the area, piles of burning rubbish, dusty patches of ground serving as playing fields and overflowing sewage all portray Duma’s situation which is only a stone’s throw from the mansions in the pristine leafy Northern suburbs. The action scenes using the actors for close-ups and with Siseko and Piers as body doubles are very realistic and totally believable. The actors, Lemogang and Grant, had to learn to look credible in a boat in just 4 months whereas it takes years for most people to become proficient paddlers. Near the end of the movie Duma, now in the front seat of the boat decides to deviate from their agreed plan to portage around a particularly dangerous rapid. This is the very same rapid which had scuppered Steve’s previous bid for gold. Duma heads the boat straight for the rapid in a gamble to get into the top 10. Earlier in the story, Steve had told Duma, who is afraid of dogs, to “look the dog in the eye.” With Steve frantically yelling to Duma to put into the side of the river Duma yells back over the roar of the raging torrent, “Bra Steve look the dog in the eye!” Steve gets a wry smile and then yells “Let’s do it! This is not a book review but the book, Confluence, written by Piers Cruickshanks is well written with a good sprinkling of wry self-effacing humor. It is very readable and, I think, can be read before or after seeing the movie. They do complement each other and I would recommend seeing the movie and reading the book. Watching the movie on the silver screen gives one the full effect of the beautiful camera work. The DVD has bonus scenes about the making of the movie which was really interesting. In your interest, dear readers, I went to the movies and watched the DVD! It is a movie that can be watched more than once. I may be biased, but I believe that nothing in this movie: not the cinematography, not the script, not the direction and definitely not the acting compares unfavorably with any mega budget Hollywood offering. And furthermore, it is really cool to spot familiar places, to recognize some of the people involved and to hear real local dialogue. Beyond the River is right up there with Invictus, The Bucket List, Erin Brockovich and all Meryl Streep movies as one of my favorite movies. 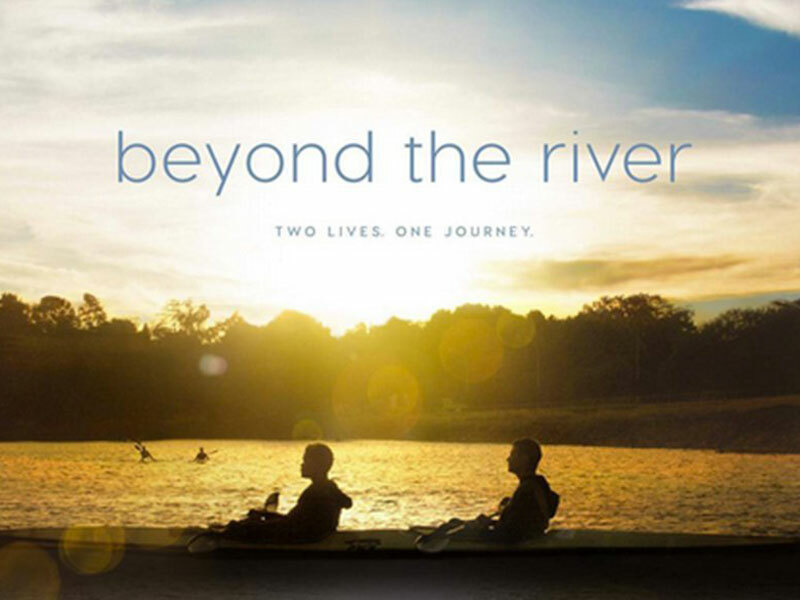 Please watch Beyond the River – it is much more than a movie about paddling the Dusi! This is an objective and independent review as I have no connection whatsoever with the makers of the movie and don’t even know anyone connected in any way with the movie. I paid for our movie tickets. The book and the DVD were purchased at retail outlets by a family member. Chris is an Ultra Runner (Road & Trail) and a sports nut. He’s an avid Red Wine drinker, but not a connoisseur, “That would require knowing more than is this nice?”. He has been happily married for many years and a devoted dad of three. He's a reader, writer and coffee addict who has a child-like thirst for knowledge. Chris believes that Life is Good!